When you lose someone in your family the initial shock and grief are often followed by the realisation that there is a lot of work to do to. 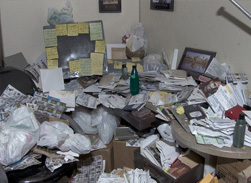 Not only must the funeral be arranged but often a lifetime of accumulated stuff must be dealt with. While things of value can be sold or given to a charity such as St Vincent De Paul there are many things that are of such low value they are not worth the effort to sell or give away. Inevitably there will be some items that will need to be taken away or given away and then there is the rest that you just need to get out of there so the place can be polished up and sold or rented out. You can literally spend days or weeks clearing out junk and rubbish from some old houses and getting yards cut back and made tidy. When you have a funeral to arrange, administration to take care of and work – all this additional work is simply impossible to do. This situation is exactly the sort of job that is ideal for 1300Rubbish. Because they are professional, have a proven system and have been in the industry over 15 years they can take the hard, time consuming work off your plate and allow you to get more done. Because they are a “hands on” rubbish company they can take instructions and pick the rubbish up where it lies – so you don’t even have to make a pile, they can do it all. Once the rubbish is gone from the house and yard they will even sweep up – leaving you with a house that is ready for whatever your family need to do with it. The rubbish will be taken away, recycled where possible and disposed of in the most efficient way possible. So if you find yourself in the situation of having to deal with a deceased estate – give 1300Rubbish a call, they are incredibly good value and ready to help.